Ireland sent Wales back to the drawing board with a thumping victory under the roof in Cardiff as both teams stepped up their Rugby World Cup preparations, but a cruel injury to Tommy O'Donnell may well have ended his hopes of featuring in the game's biggest tournament next month. Ireland raced out to an early lead with Jamie Heaslip crossing for the game's first try, before Darren Cave and Keith Earls scored in quick succession to establish a stunning 25-0 lead on the half-hour mark. Wales stemmed the tide with a neat lineout try for Richard Hibbard, while Eli Walker narrowly failed to touch down right on the stroke of half-time. The second half was broken up by substitutions throughout, as players were given a run by both Warren Gatland and Joe Schmidt, but Irish tries kept flowing. Simon Zebo and Felix Jones extended Ireland's lead to 35-7 with 15 minutes of the second half played. Justin Tipuric touched down for Wales' second try with 10 minutes to go, capping a fine move that was out of keeping with the rest of his side's play for much of the match. O'Donnell was stretchered from the field in tears with what appeared to be a leg injury, which may well have put his World Cup hopes in doubt. As time expired, Alex Cuthbert scored in the corner to put a misleading slant on the scoreline. Wales showed 14 changes from the side than ran Six Nations opponents Italy ragged in Rome last March, with only prop Aaron Jarvis remaining, while there were Test debuts for Ross Moriarty, wing Eli Walker, centre Tyler Morgan and lock Dominic Day. 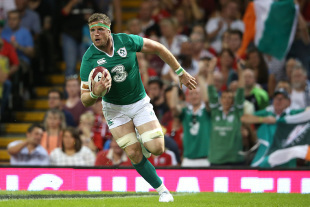 Ireland, meanwhile, recalled centre Earls and lock Donnacha Ryan for their first Test starts in 29 months, while Heaslip won his 73rd cap to overtake David Wallace as his country's most capped back-row forward. The Millennium Stadium roof was closed, replicating conditions ahead of the World Cup next month when both countries will play pool games in Cardiff, and Ireland struck an opening blow after just nine minutes when Heaslip touched down unopposed following a powerful run by scrum-half Eoin Reddan that set up an imposing attacking position. And matters did not get any easier for Wales, and after Earls went close to scoring Ireland's second try, his midfield partner Cave then pounced from short-range, with Jackson's conversion following an earlier penalty that opened up a fully-deserved 15-0 advantage. Wales could not get into the game, and when fly-half James Hook tried to free Walker in space, the Ospreys speed merchant was crunched by an immense Andrew Trimble tackle and Earls sprinted 30 metres to claim Ireland's third try before another Jackson conversion made it 22-0. A Paddy Jackson penalty took Ireland 25 points clear, but Wales belatedly stirred at the end of a half that had seen them display some worrying defensive deficiencies when Hibbard touched down wide out following a slick Tipuric pass, before some acrobatic work by Walker almost saw him score following a clever Hallam Amos kick. Wales, though, could have no complaints about the 25-7 interval scoreline, and they required a vast improvement during the second 40 minutes or face the prospect of suffering a comprehensive home defeat. Seasoned international Taulupe Faletau replaced No.8 Dan Baker at half-time, but Wales still struggled for momentum as Moriarty was yellow-carded for a reckless lunge on Zebo that did not help his team's cause. Jones then continued the game's one-sided nature with another touchdown, and although Ireland had substitute forward Chris Henry sin-binned for a technical offence, they were way too far in front for it to make any difference, even though Wales had the final say with a Tipuric solo try and Cuthbert's corner finish that gave the scoreline an unbalanced feel.